This will be a departure from what I typically share here. Since it is Valentine’s Day I thought I’d ponder a bit on romance and love and the characteristics I would like to find in a husband. Don’t take this the wrong way gents, these are ideals — not a unit of measurement. And before anyone asks, yes, that is an actual picture of me. Many little girls grow up dreaming they’re princesses and hoping one day to find their very own Prince Charming. You could blame it on Disney, but I’m sure the stories predate good old Walt. Personally, I didn’t really go in for the princess thing. I was too busy pretending I was a cowboy. Thanks, Dad. But that doesn’t mean I haven’t been swept off my feet by fictional characters. In fact, I’ve crushed on a long list, from Alex P. Keaton, to Johnny Castle, to Gilbert Blythe, C. K. Dexter Haven and many, many more. But fiction and real life are radically different from one another. I have yet to have anything in my life resemble a Hollywood plot line, much less a fairy tale. And I’m old enough to have a more realistic view of what sort of man I’d like to marry, if I am ever blessed to be married. The fact is, even from youth most of us want to spend our life with someone we love. Certainly, I do. That’s perfectly natural. After all, God realized it wasn’t good for man to be alone so he made Adam a helpmate: Eve. Life is better when someone’s got your back. But that doesn’t mean it’s easy. Sadly, life isn’t a fairy tale. Ever since the garden of Eden, we humans have been sinning and that screws everything up, including (perhaps especially) our interpersonal relationships. The union of two sinners in marriage is never going to be easy; in fact, it seems impossible. Without Jesus Christ, I think it often is. But that doesn’t mean it isn’t worth it. I am a single woman and I believe in marriage. I believe it is a great thing, but I am not so naive to think it won’t be incredibly hard work. My parents love one another, but their marriage hasn’t been a picnic. Staying together and putting up with one another can be very difficult. I’ve heard of people making ridiculous lists of all the things their spouse must be to be marry-able. Often they are full of shallow or unrealistic things, that simply keep us from being willing to date and potentially marry real people. There is such a thing as having too high of standards. I think my requirements are actually pretty realistic. My must list for a husband is very short: he must be a believer in Jesus Christ (a real one, not just someone who professes), theologically similar, be my friend and be able to make me laugh. Since practically everyone can make me laugh, that’s barely a requirement. But of all the fictional men I’ve admired, there is one whose character actually reflects what I would love to find in a husband. Many of my friends know that I am a huge fan of Jane Austen’s novels. The oft-disliked novel, Emma, is actually my favorite. I love it because the characters are so deeply flawed, they seem practically like real people. 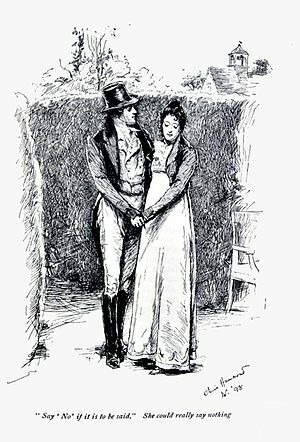 The man of that novel, Mr. George Knightley has a number of character traits I hope that my future husband has. I also love the depth of their friendship. Since he was her brother-in-law and had known Emma nearly all her life, Mr. Knightley and Emma know each other incredibly well. It isn’t love at first sight, or mere infatuation. It is deeper and wider, and I would argue, more satisfying. They already know each others flaws and failures and have clearly weathered arguments with one another. Although the book doesn’t specify the “plain, unaffected, gentleman-like English” words he used to propose to Emma, I find the 1996 film version’s way of putting it just perfect. “I do not wish you to call you my friend, because I hope to call you something infinitely more dear.” And later he says the sweetest line I’ve ever heard: “Marry me, marry me my wonderful, darling friend.” I melt every time I watch it. Ephesians chapter 5 speaks to the need for both husband and wife to be selfless, calling for wives to submit and husbands to love their wives “as Christ loved the church and gave himself up for her…” Of course, such an attitude is only possible through Christ. There are other more trivial things I really like about Mr. Knightley, like the fact that he’s not lazy (He walks to Hartfield practically every day.) and the fact that he is much older than Emma. I certainly don’t deserve a Mr. Knightley, but I still hope one day someone who resembles him (at least a little) will be my valentine. This entry was posted in Christian Life and tagged Bible, Christian, christianity, Emma, faith, George Knightley, Jane Austen, Knightley, love, Marriage, romance, single, Valentine's Day. Bookmark the permalink. How alike we are… I discovered Jane Austen only a few months ago (and have not finished reading, re-reading etc) – I am French – but I had discovered and valued this merit in a lover, in Balzac’s “Modeste Mignon” (La Brière disapproves openly Modeste for speaking respectlessly to her father, while her two other professed lovers flatter her in). And I too, identified to male heroes in childhood and adolescence, not to female ones. And I too identified his actions with this part of St Paul’s about marriage. And I was lucky enough to meet the person I know now to be the model for Mr Knightley (Jane Austen had certainly a time machine 😉 ) when I was 18. We have been married more than 20 years now, and, well, can such a man become better and better with the time? I believe he does; dearer and dearer too. I don’t deserve him because I have so much less virtues than him, but I am very glad to see he is happy as my husband (and always more loving, who could have thought it possible? ), maybe because a Mr Knightley really loves teaching and improving, particularly a beloved wife. So, I can only wish you a good luck. Don’t worry too much : Mr Knightley being wise and patient, he won’t marry any woman just to get married or to have a girlfriend. The worry comes from the fact that a character such as Mr Knightley’s, might depend on education. And present time education is less than satisfactory and has little to do with enhancement of sense of duty.